I’ve seen some nonprofits slap a link to their PayPal account on their website and consider the job done, but it’s often those same nonprofits who come to us wondering why they’re not seeing a boost in donations. While a PayPal link is a start, there’s a lot more that needs to be done to your website in order to start seeing significant increases to your donations online. Think of your website as your personal assistant. Once set up properly to receive donations, it makes it easy for someone to donate online and it cuts out the administrative work of processing their donation for you. 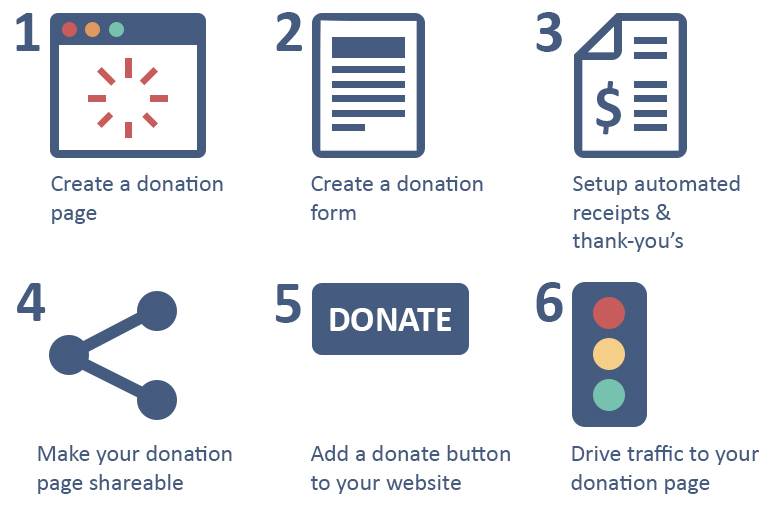 The best part is that with just six steps, anyone can setup their website to collect and optimize donations. And if you're building a full membership management website, we've got a free instructional webinar coming up that will teach you three website changes that will start attracting new members right away: Turn Your Website Into a Membership Growth Engine. A donation page is a one-page sales pitch that includes all the information someone needs to make a decision to donate to your organization. This is the page you direct someone to after you’ve asked them to make a donation to your organization. Before creating your page, it’s good to know that our brains are hardwired to make us feel good when donating, so anything that you do to increase that feeling can increase your donations. Research shows that telling someone about the benefits of your donation campaign is one of the best ways to do this. Your organization’s mission: This lets potential donors know why you exist and why they should give to your organization. In fact, this information is the most important thing potential donors want to know before donating. Your organization’s branding: A study of 45,000 nonprofits found that branded donation pages received 700% more donations than generic ones. This is because branded donation pages appear more trustworthy. A story about someone your organization helped with an image of that person: Studies have proven that people are more generous when they can identify with the story and image one a single person versus a group of people. A breakdown of where a donation goes: This is the second most important detail donors want to know when deciding whether to donate. A personal message from your President or someone on the Board: This is a top tip by donation page expert, Abby Jarvis from Qgiv. When you create your donation page, try to keep the layout similar to the rest of the pages on your website. If you need some help with the layout, check out these 10 great examples from Wired Impact. When I was a kid, I collected donations for my soccer team the old-fashioned way: door to door. It took me a whole afternoon to do one block and I had to put in the same effort every year. If I could go back in time, I’ll tell my younger self to collect my neighbours’ contact information along with their donation. That way, the next year I could just email everyone a link to my PayPal account and collected their donations in minutes. This is what the most successful nonprofits do. They keep their donor information in a database and reach out regularly to ask for repeat donations (just like I should have done). Not only does this increase donations, because half of first time donors donate again, but it allows them to spend more time finding new donors. Here’s an example of a great donation form from the North Center Neighborhood Association that collects the right info. Notice that they also include a CAPTCHA at the bottom of the form. "Nonprofits tend to get targeted by fraudsters testing card numbers, because they have a simple form which can be easily submitted to automatically," says John Cooper, of The Friendly Developer. "Either using tools like a CAPTCHA, or a hosted page like PayPal helps to prevent this." When launching your next donation campaign, go into your database and email, call, or send your past donors a letter to increase your donations. This step is less about increasing donations and more about saving you time. One of the biggest complaints about managing a nonprofit I hear is how much time administrative tasks can take. My advice is always to automate things using software. In the same light, there are programs you can use, like Wild Apricot that can send out an automated tax receipt and thank you message the instant someone donates through your website. Last fall, I climbed the CN Tower to raise money for United Way. While training, I shared updates of my progress on Facebook with a link to my donation page. To my surprise, I ended up raising $270 on top of the donations I had collected in-person just from people following me on Facebook. If you make your donation page shareable, more people will hear about your campaign and more people will donate. Add a “tweetable” to your donation page. A tweetable is a pre-written tweet that someone can click on and share with their Twitter Followers. Ask people to share your page on Facebook. JustGiving increased shares of their donation page by 28% just by asking people to share it and including a share button. A month back, I was talking with a friend who signed up to participate in a walk for cancer research. I agreed to donate, but as we kept talking the subject changed many times. Unfortunately I completely forgot about donating and only remembered a week later. This same situation happens when people come onto your website and it’s not easy to locate the donation page. They might start reading your news, or browse your upcoming events, and before they know it, it’s slipped their mind and you’ve missed out on a donation. This is why it’s important to have a “Donate” button that’s easy to find on every page on your website. It’s important that this donate button and the menu item both link to your donation page as described in step one. That’s because your donation page is your best pitch on why someone should make a donation and by how much. I just want to mention again that to avoid fraudsters using your donation form to test fake credit cards, make sure you use challenge-response authentication like a CAPTCHA. Here’s a marketing tip used by the pros. It’s called the 80/20 rule: spend 20% of your time creating content and 80% of your time promoting it. That’s because there’s so much clutter on the internet, you need to spend a significant amount of time promoting yours to help it stand out. This rule can be applied to your donation page too. After you publish it, make sure you promote it. One thing that can make it easier to get more traffic to your donation page is to promote it during months with high natural giving trends. April and October see natural increases in online donations. One third of all online giving happens during December, with 22% occurring on December 30th and 31st. Blog: Publish blog posts during these months with stories about your cause, ask for donations, and include a link to your donation page. Regular readers of your blog can learn more about your campaign and donate while they’re reading. Scheduled Emails: Pre-write emails asking for donations and schedule them to send automatically during these months. There are a number of tools that can set this up for you. If you’re a Wild Apricot customer, you can use our easy email scheduler to do this. Social Media: Use the free version of HootSuite to schedule social media posts (Twitter, Facebook, LinkedIn) asking for donations during these months. That’s because traffic to your donation page may slow down as time passes. To keep traffic up, make sure you have a plan in place to keep writing blog posts, keep sending emails, and keep updating social media. Wild Apricot has helped thousands of small and medium-sized nonprofits build websites optimized for donations in a matter of minutes. If you’re looking to create a powerful donation generation website and save time while managing your organization, consider starting a free trial of Wild Apricot.